Toothpick-plant (Ammi visnaga): growing, planting, caring. A common weed in the carrot family! Ammi visnaga - the toothpick-plant or Bishop's weed - is a species of flowering plant in the carrot family, native to Europe, Asia, and North Africa, but easily found throughout the world as an introduced species. It is an annual or biennial herb growing from a taproot erect to a maximum height of 100 centimeters, with leaves up to 20 centimeters long, oval to triangular in shape and dissected into many small lance-shaped segments. 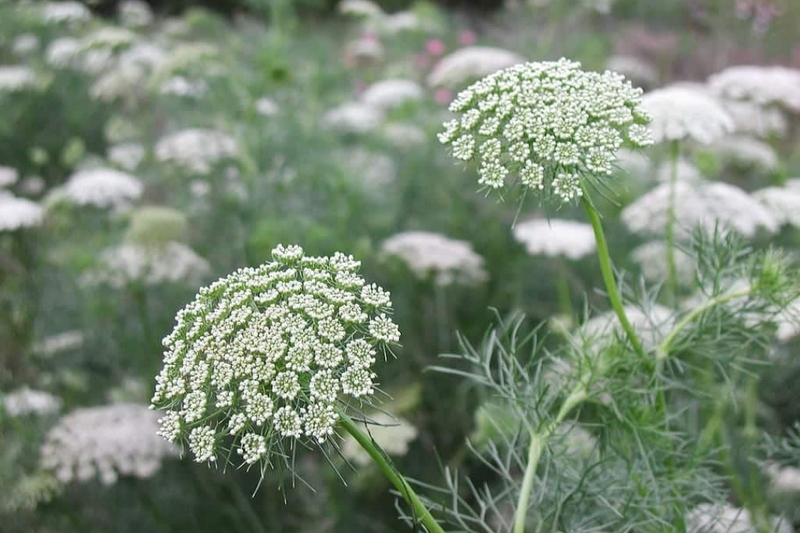 The inflorescence is a compound umbel of white to a yellow-green flowers similar to those of other members of the Apiaceae family. This annual grass has an erect, branched and spreading habit of up to 1 meter. Its foliage is evergreen, very aerial and vaporous, light green, glaucous. The stems are fluted, very thin, and used to make toothpicks. Annual fennel is interesting for its very long bloom from July to autumn. The inflorescence is in compound umbels, that is to say that the large umbels are composed of small umbels which in turn possess tiny flowers with 5 unequal petals. The color of the flowers evolves between the white, the creamy white, the acid green, to the greenish yellow according to the evolution of the flowering and the fructification. The fruits are small, dry, brown. The plant gives off a slight fragrance not always appreciated. Sow in place in April, preferably in clay soil, in the sun or in semi shade. Seeds emerge easily, in two weeks. Plant from April to June, in sun exposure to partial shade, in indifferent soil, with a slight preference for clay soils. Plant in a finely worked soil (chipped, scratched then raked), checking that the last spring frosts have passed. Once the soil is properly prepared, simply make a small hole with a transplanter, remove the plant from its bucket, put it in the hole, and compact the soil to put it in contact with the roots. Respect a spacing between the plants corresponding to one third of its intended width. Water copiously to facilitate rooting. For plants with superficial rooting, just pull them out. If it does not work, help yourself with a spade. You can collect the seeds that fall from the "umbel" (flower tray) of the plant for the following year! Annuals multiply mainly by sowing, so consider harvesting the seeds in late summer, and sow them again in April.